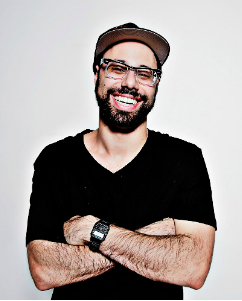 Born in Windsor, Ontario, Dave Merheje found a love for comedy at a young age and started performing in Detroit. Now living in Toronto, Dave’s comedy style has been described as aggressive in-your-face funny. Dave has gained a following with his “no fear” approach on stage, with enthralling story telling, and has even produced his own series of comedy shows called the “We Ain’t Terrorists Comedy Tour”. He’s also performed all over Canada and the US; including all the top clubs in New York and LA. Dave shares his unique vision and life experiences from the stage, with an improvisational, high energy style. He possesses uncanny ability to take you on a wild comedic journey that leaves you bursting with laughter, which is what has gained him such a loyal following. He gives you an arithmetic interpretation of urbanized life delivering one of the most original acts emerging in Canada.